• Heat oven to 390F/200C. •Put the chicken, carrots, onions and ginger in a large roasting tin. • Sprinkle with seasoning, drizzle with olive oil, and roast for 30 mins. • Transfer everything from the tin, including the fat and juices, to a large saucepan. • Add the shiitake mushrooms and the pork, and pour in 3 litres of cold water. • Bring to the boil and turn down to the lowest simmer you can. • After the foamy scum rises to the top, skim it off with a ladle and discard. • Part-cover with a lid. • Let it simmer for 3 hrs but remove the pork after about 2½ hrs, or when it is very soft, and set aside. • Strain the stock into a clean pan. • Save the chicken and use it for something else. • Boil for another 30-40 mins on a medium heat to reduce by a third, then skim the excess fat off. Add about 1 tsp salt and taste to see if it needs more. 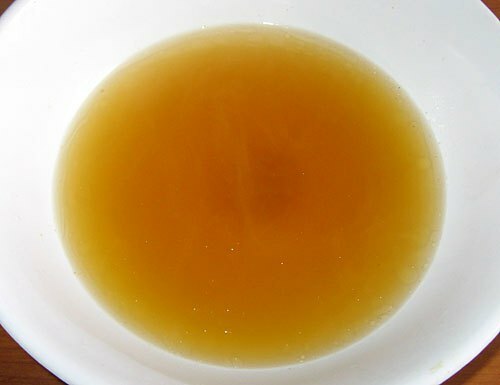 Note: To substitute mirin, add between 1 and 2 tablespoons of sugar to 1/2 cup of white wine, vermouth, or dry sherry to replace 1/2 cup of mirin.